33pcs LEDs make it bright enough to ensure your marine requirements, provide a simple and effective boat safety lighting. LED light source, energy saving and low power consumption, won&apos;t run hot like the traditional bulbs. Round shape and lucid lens for better light transmittance, 360° lighting can illuminate wider range. Made of premium quality material, ABS housing and base, IP65 waterproof, durable and no need to worry about marine working. Great for boat accessories gifts. 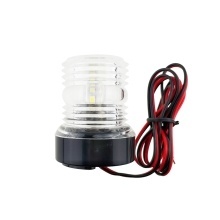 Perfect replacement lights for the front of the pontoon boat, meet wildlife and fisheries regulations.